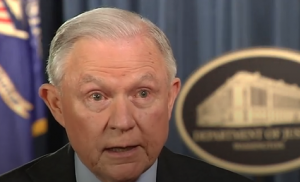 President Trump announced the resignation of Attorney General Jeff Sessions on Wednesday afternoon, ending a long-tumultuous relationship with the nation’s top law enforcement official. Trump said on Twitter that he’s replacing Sessions with the attorney general’s chief of staff Matthew Whitaker. The forced resignation came just one day after the midterm elections. Trump has publicly clashed with Sessions since he recused himself from the Russia investigation. That allowed the deputy attorney general to hire special counsel Robert Mueller in April 2017 to investigate Russia meddling in the 2016 presidential election. With Sessions gone, Whitaker may have the authority to take over Mueller’s investigation. Trump had tried endlessly to shame Sessions into resigning, but Sessions didn’t budge. The resignation is sure to have some political ramifications. Posted: 11/7/18 at 3:31 PM under News Story.